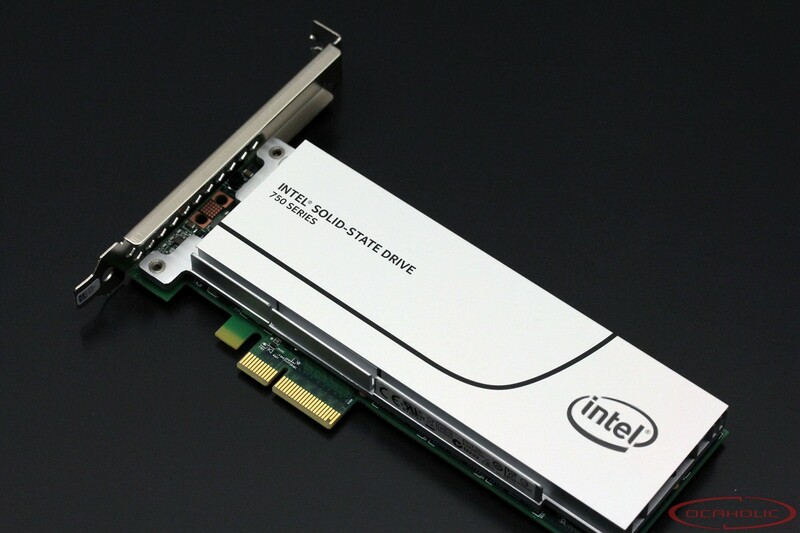 With the SSD 750 Intel was the first manufacturer to launch an NVMe-SSD for end users. The drive which is lying front of us in this case performs extremely well pumping out up to 2200 MB/s sequential read and 900 MB/s sequential write throughput performance. Apart from that there is the sheer capacity of this drive as well as the fact, that you get MLC NAND flash memory. Intel is the first company which launched an NVMe SSD for end users. NVMe or NVM Express stands for Non-Volatile Memory Host Controller Interface Specification (NVMHCI). These specs define how solid state drives are being accessed through the PCI Express bus and therefore directly communicate with the CPU. NVMe replaces AHCI in the case of SSDs and it brings quite a few advantages to the table. AHCI, or Advanced Host Controller Interface, was optimized for drives with low throughput and high latencies. Apart from that it could not deal with high parallelism, being limited to a queue depth of 32. NVMe on the other hand has been designed to leverage the benefits of SSD from ground up, which means it can deal perfectly with low latency and high throughput drives. Apart from that it supports another magnitude of parallelism, whereas the queue depth can reach up to 65536. Since SSDs are based on controllers, which usually feature between eight and ten channel, parallelism is a key factor in gaining more performance. The SSD 750 from Intel even features an 18-channel controller. This is setting a new benchmark in the consumer segment and basically the main reason why these drives can reach such high throughput speeds and IOPS numbers. Having a closer look at the specs we see that Intel claims the 400GB SSD 750 can reach up to 2200/900MB/s sequential read/write, which is simply a new level when it comes to the desktop market. Apparently this kind of performance in combination with a high-capacity drive doesn’t result in a bargain, which is why this particular drive will set you back almost 330 Euro. Nevertheless, for this kind of money you really do get a drive, which outperforms almost anything available on the market to date and also offers plenty of capacity so you can even save a lot of data on it.